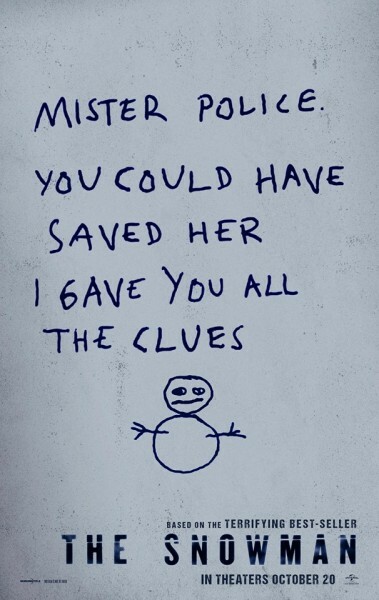 The Snowman is a British crime thriller based off the best selling novel of the same name written by Jo Nesbø. The movie stars German-Irish actor Michael Fassbender (Detective Harry Hole) from the X-Men franchise and Swedish actor Rebecca Ferguson (Katrine Bratt) from Mission Impossible: Rogue Nation. While the film can be slow and uninteresting, it also has an eerie suspenseful feel as they draw closer to the killer. The film follows detective Harry Hole from Oslo, Norway as he looks into the disappearance of a victim on the first snowfall of winter. Hole both believes and fears that an elusive killer calling himself “The Snowman” may be active again after being dormant through the rest of the year. With the help of new recruit Katrine Bratt, the two need to connect the new, brutal cases to those that are decades-old and cold (unsolved) to outwit the killer before he strikes at the next snowfall. Throughout the movie, the main focus of certain scenes is constantly changing between Fassbender and Ferguson, creating confusion and requiring the characters to be paid attention to more than needed, distracting from the plot. Other characters also seem minor compared to Hole and Bratt, as almost every scene has one or the other. Some of details in the film that seem like they could lead to something critical aren’t followed up by anything important, and the detail is never brought to the audience’s attention again. Certain details are almost forgotten instantly, and it’s a similar case with almost every character. They are introduced by their names, but not referred to as much as the movie progresses. Certain characters, however, like Magnus Skarre (Jakob Oftebro), Oleg Fauke-Gosev (Michael Yates), and Mathias Lund-Helgesen (Jonas Karlsson) are easier to remember because they are more often referred to or they play a critical part without being the lead. They are the most interesting characters next to Fassbender’s and Ferguson’s. One problem with the movie would be the fact that there aren’t as many action sequences as you’d think for a thriller. Also, the trailer reveals more than the movie itself, giving the audience more think about after the previews than they do by the end of this movie.